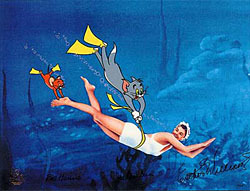 In 1953, swimming superstar Esther Williams took the plunge and allowed the scene-stealing cat and mouse, Tom and Jerry, to appear opposite her in the bubbly MGM® muscial, “Dangerous When Wet”. Bill Hanna and Joe Barbera earned Oscar®’s for 7 Tom and Jerry cartoons in ten years…still an unbroken record. This fabulous Hand-painted Limited Edition Cel is triple signed! Each work of art is signed by small screen legends and creators Joe Barbera and Bill Hanna, and screen legend Esther Williams.